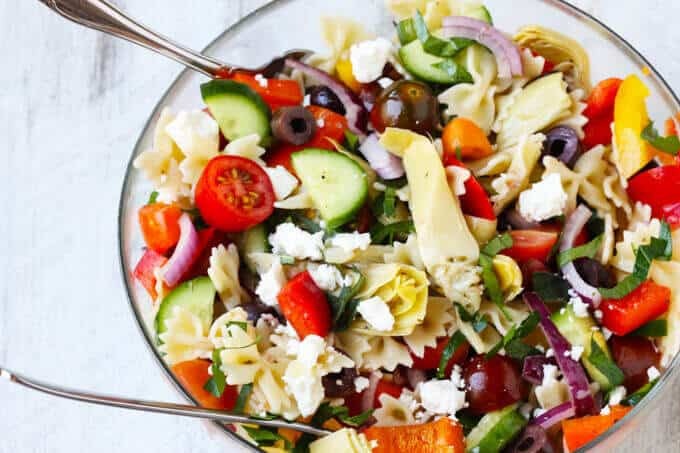 This popular Italian salad is a perfect addition to any summer meal or BBQ. 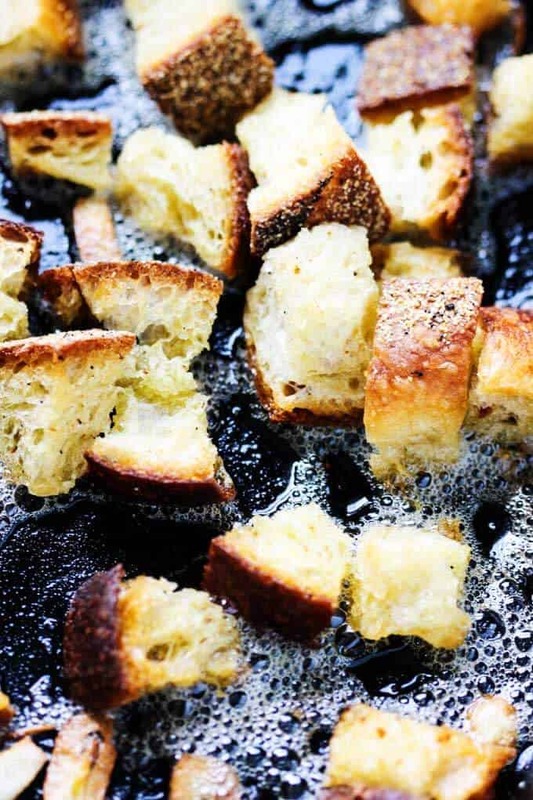 Crusty bread that’s been infused with garlic butter makes this it irresistible. 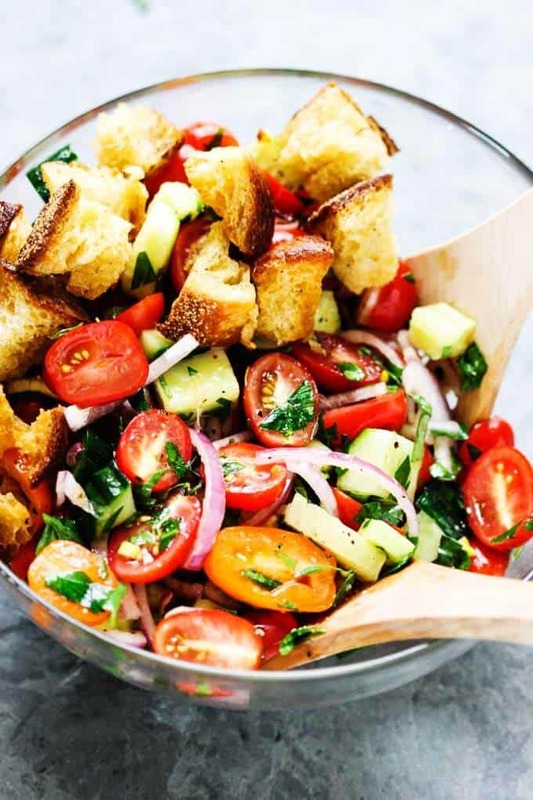 Next time if you’re looking for a perfect side dish try this amazing Summer Panzanella with Garlic Butter Bread. Huge part of the Mediterranean diet are salads that contain some sort of bread with lots of olive oil, of course. 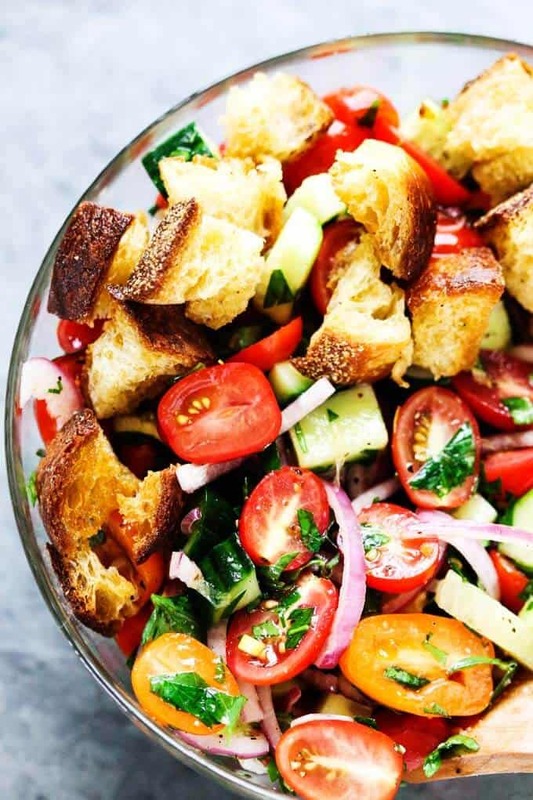 This summer panzanella with garlic butter bread is no different. 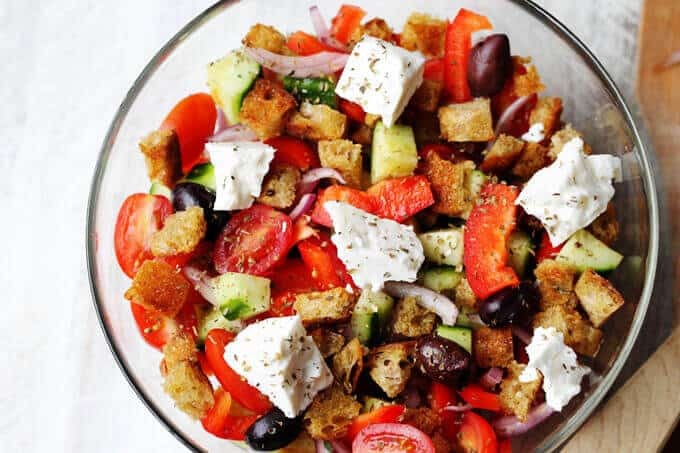 I used to make my panzanella with just cubed bread and let it soak in the juices that vegetables released with a combination of red wine vinegar and olive oil. But when I tried infusing my bread with garlic and butter first and then bake it until golden perfection, it was a game changer. This salad is so perfect for a summer BBQ. 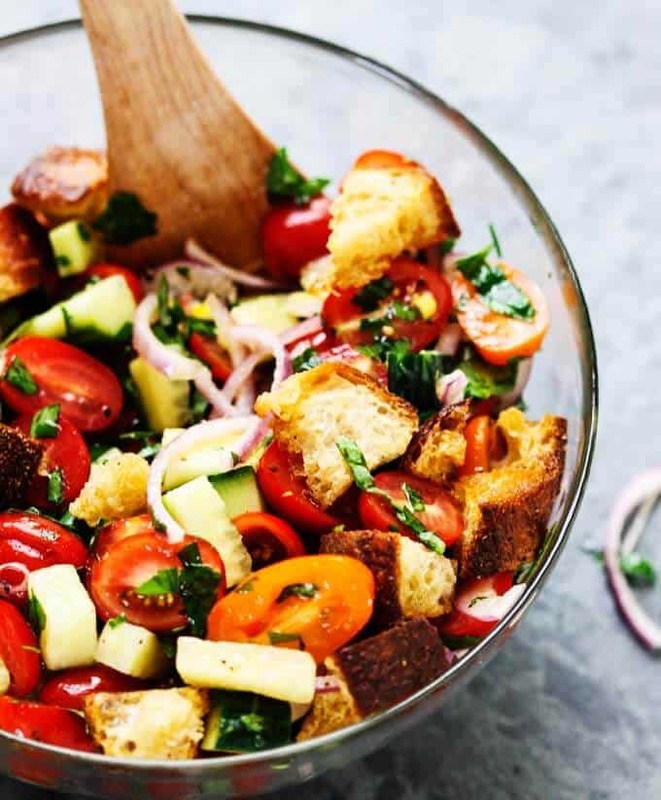 You can throw on a grill whatever you feel like, whip up the summer panzanella with garlic butter bread and you have dinner ready in 30 minutes. What I really like about this salad is, that it is actually almost a whole meal in itself. It’s like vegetable sandwich in a bowl. 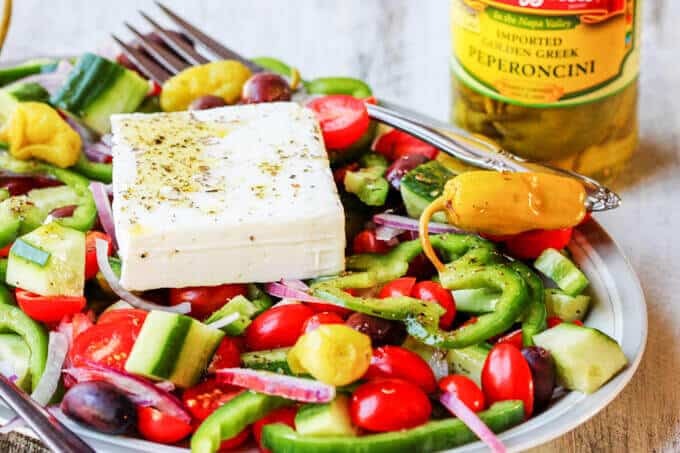 You have your vegetables (fresh tomatoes, cucumbers and red onions – you can’t go wrong with that), your carbs in the form of bread and your fats in terms of olive oil and butter. Ok, ok it doesn’t have protein but if you really want to make it like a whole vegetarian meal, just add some chickpeas or mozzarella cheese. I like it the most with some grilled light chicken, like these Mediterranean Chicken Kebabs or Italian sausage, but again possibilities are endless. 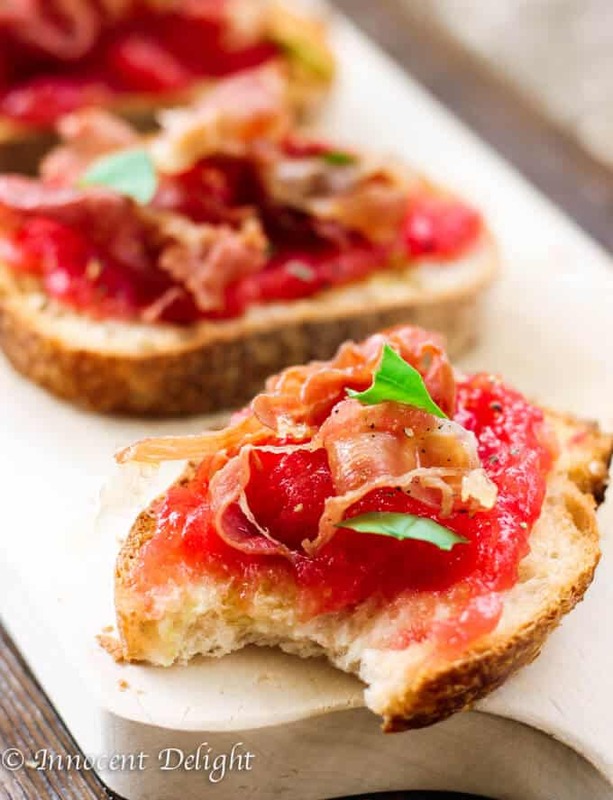 I love fresh, fast and easy summer recipe. Have you tried yet my tomatoes and peppers stew – classic Hungarian Lescho or quinoa pasta with no-cook tomatoes sauce? They are really great and take no time to prep. Recently I invited a couple who I met in my home town, for BBQ dinner. They are my Polish people and they are super awesome. We felt the instant connection right from the gecko. The best part is that they have a daughter that is very close to my son’s age, so we had two little blond cuties running in my backyard. Anyways, I prepared my summer BBQ manu. I marinated some Honey Harrisa Chicken Skewers, made a garlic yogurt sauce for this, made some Polish Rice Salad with Corn, Ham, Cucumber and Chives, Polish Sausage and of course my summer panzanella. I was sure that Polish sausage and Polish salad will be the hit of the night. Gosh, I was mistaken. They were raving about my panzanella. For them it was an absolute winner that night. I’m not sure if any more endorsement is needed. 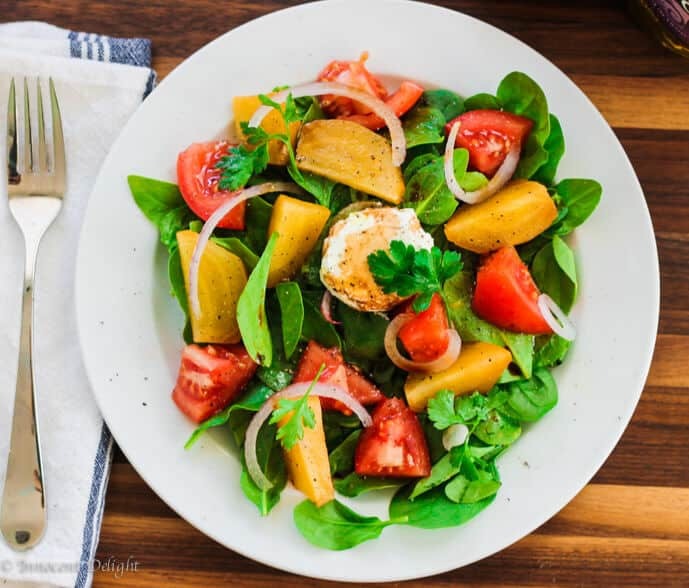 Try it soon and this salad will stay with you through the whole summer. You will want to make it over and over. I LOVE summer! Cheers my friends. Oh and by the way, I think that my version of Summer Panzanella with Garlic Butter Bread would not be approved by Florentine traditionalists, at least according to Wikipedia. 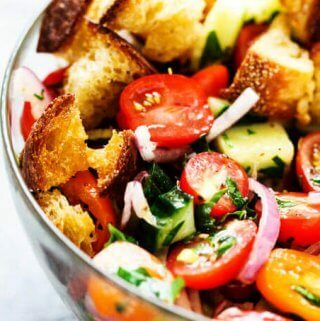 Panzanella should contain only onions and tomatoes and in fact until the 20th century it was only onions. Isn’t that interesting? This popular Italian salad is a perfect addition to any summer meal or BBQ. 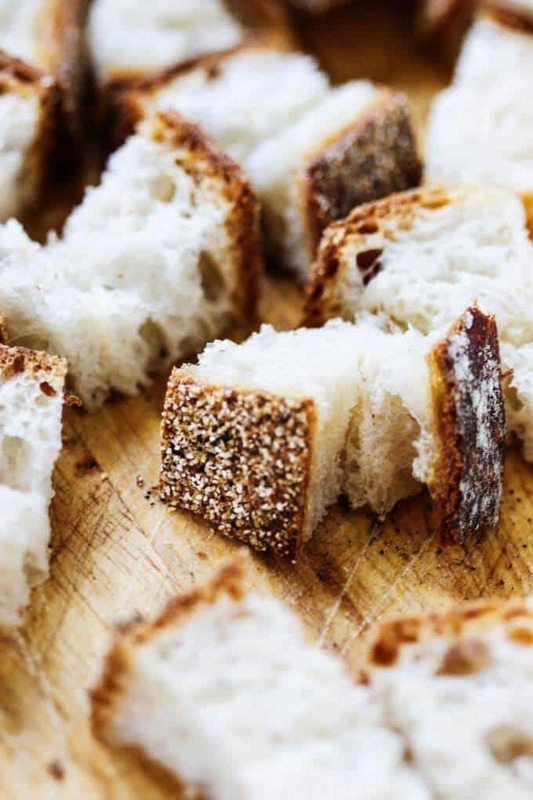 Crusty bread that's been infused with garlic butter makes this it irresistible. 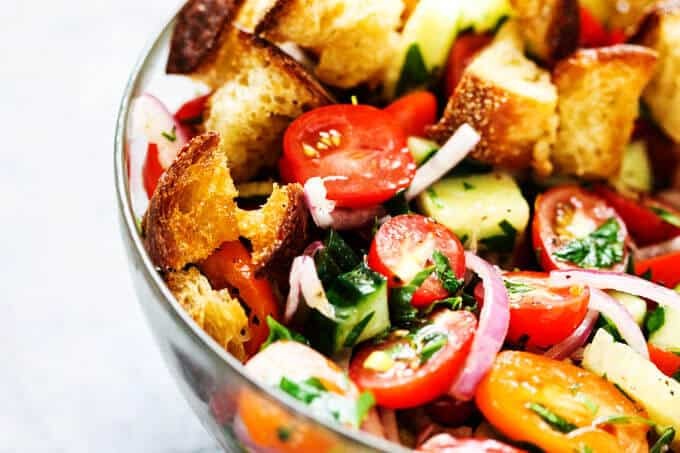 Next time if you're looking for a perfect side dish try this amazing Summer Panzanella with Garlic Butter Bread. the photos of this panzanella are just incredible. really wish it was summer here in australia now! ” right from the gecko” are you trying to be cute, because it is cute, but it is “right from the get go”. I’m going to start saying right from the gecko from now on! I have a friend who calls the umbilical cord the umbiblical cord. I will never correct her. Ooh! This looks like a declious salad. I do like your suggestion to stir in some chickpeas. Although, some roasted almonds would also be delish. This is one of my favourite salads and it just screams summer. These photos are beautiful too. I absolutely love this salad, so delicious and flavourful. Ciesze sie! Mam nadzieje ze bedzie smakowac! I just did a trial run on the garlic bread cubes. They ended up being mushy and saturated with butter and oil. I will cut it back by half for the next go round. Thank you Denise. I’m not sure what went wrong for you. They always come up crispy for me and I make this recipe often.